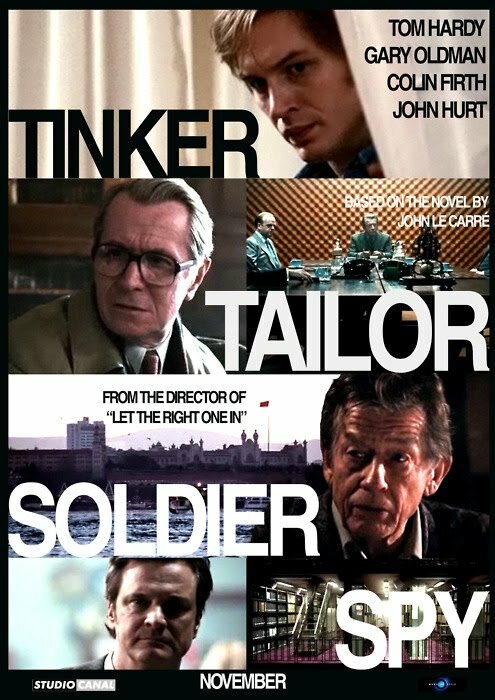 Tinker Tailor Soldier Spy is set in 1973, during the Cold War era in Britain. Two elderly men are being sacked from the head of MI6. They are George Smiley (Gary Oldman) and Control (John Hurt). Their dismissal comes from the bungle of a meeting a year earlier where Jim (Mark Strong) was meant to meet a General who would tell him the name of a Russian mole who has infiltrated British intelligence. In flashback we discover that Jim was shot and left for dead. In the present day he has resumed his life, living in a caravan and working as a school teacher. When Control passes away, Smiley is asked to return to the 'Circus' to help track down the mole. Amidst some of the suspects are Ricki (Tom Hardy), Bill (Colin Firth), Peter (Benedict Cumberbatch), Roy (Ciaran Hinds) and Percy (Toby Jones), some of whom have been likened to the pieces on a chessboard by Control. 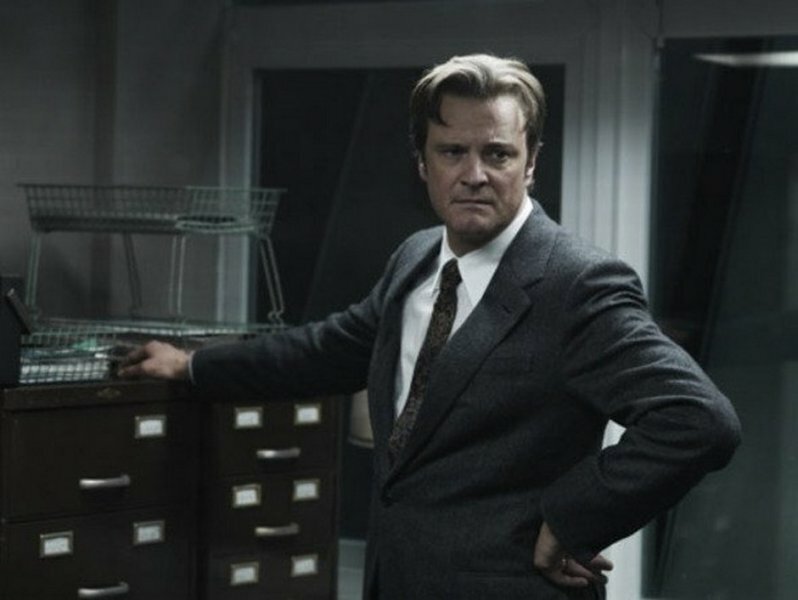 You will have to see Tinker, Tailor, Soldier Spy twice. There are several reasons for this. Foremost, it is an impeccably made thriller from Tomas Alfredson, the Swedish director who gave us Let the Right One In (2008). This is a director who knows how to tell a story in what is sadly regarded as old fashioned terms. He is not interested in elaborate chase scenes or action sequences, but rather in building tension through selective pacing and a dense, compelling atmosphere. He was an inspired choice for this project because as he showed with his vampire epic, he understands that less is more. He has focused a significant amount of attention on the film's set design. Many scenes are photographed from a wide angle, realising the high levels of detail in the film's mise-en-scène. This enhances the film's realism and authenticity because each room feels tangible and involving, with a distinct amount of weight and gravitas. This is coupled with Alfredson's specificity of images, like the sweat on the waiter's brow dripping onto the table, to build an unbearable level of still, burning tension. The period looks and feels right too because the film doesn't make a point of it. It's shot in grainy, muted shades of brown and grey, reminding us that this is a period of control. The interior rooms are often lit with deep shadows over the faces of the actors, further contributing to overall sense of paranoia. Many of these aesthetic devices make the film as chilling and mesmerising as Let the Right One In. As a reward for this authenticity, moments of violence are more impacting and emotionally involving. There's some upsetting vision of a mutilated corpse and a brief assassination but Alfredson refuses to linger over these moments. In terms of direction and aesthetic control, the film is faultless. Thematically, this is a thriller of such breadth and endless complexity that you may not initially grasp how all of its intricate stands come together. This is assuming that, like myself, you have not read the novel or seen the BBC series. It is a challenge on an initial viewing but what can be drawn from the crux of the narrative is a series of anecdotes, concerned with the dissatisfaction of the British Empire. Smiley visits a woman he used to work with and she describes how the Second World War was the last honourable moment for British intelligence. There is also a riveting story of how Smiley tried to convince a man to return to their side but he was more content with returning to Russia to die. Equally fascinating is to consider the film in regards to generational change. Throughout the film Smiley is photographed swimming with old men and Control's sudden death is an ominous reminder that he is at the end of his run, forced out by much younger men too. We learn that his wife Anne left him because she was having an affair with someone younger, which also raises questions of loyalty, addressed in the film's plausible revelation. On loyalty, one of the best scenes in the film sees Peter returning to the circus to steal a file for Smiley. It has one of the most unforgettable long shots in cinema: the glass windows of an entire office, along with each floor, placed into the one frame. True to a lot of the film, it's a gripping scene for what it implies, rather than what eventuates through action. It almost breaks Peter, having to spy on his own people. For as many of those who are displeased with the Empire, there are still those who want to believe in it. The entire cast is well chosen, charismatic and sometimes funny too. They give us reasons to feel for these men. I like that they chose distinct British actors who are easy to recognise too. Oldman, even with minimal dialogue, strikes a visible level of intensity in his quiet work. Through the most ordinary lines like, 'Then what happened? ', he has an affirming grip on his character. Firth is another standout, this time playing against type and he's terrific. Although I am still not confident in how many of the storylines come together it is a testament to the filmmaking and the performance that I'd like to see the film again to find out.